Steak on the Stone is a meal like no other. A meal where you have the opportunity to cook your food exactly as you like. With our innovative SteakStones products, The Steak on the Stone Company Ltd are bringing the mouthwatering versatility of this meal to you and in this section you can find out a little bit more about what makes us the best in the hot stone cooking business and why we’re certain our products are right for you whether you’re serving at Home or in your Restaurant. What is Lava and the difference between Stone & Rock? 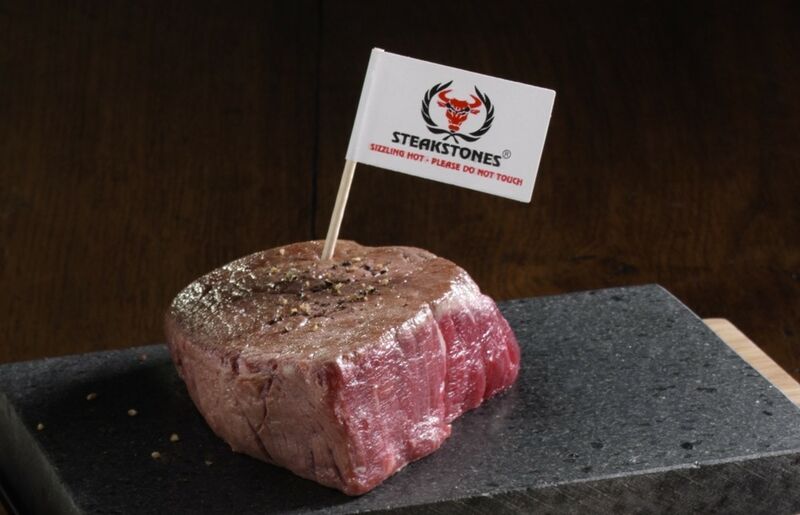 Just wanted to let you know how much we love our SteakStones, so much that we use them every weekend! We’ve told all friends about them, now they want to come to our house for dinner to try them out. The stones arrived this afternoon. Thank you for all the trouble you`ve taken. We really are very impressed! They arrived in wonderful condition. Your product is much better than I even imagined – my wife will love her Christmas gift! Thank you for your assistance on the purchase and rest assured there will be future purchases from your company, whether by me or people we recommend your company to. I just wanted to send you a quick email to thank you for your excellent customer service. I ordered the share steakstone for my fiancé for Christmas and he loves it. Before I ordered i had to ask some questions which were responded to almost immediately by steakstones staff, the item arrived here in Australia in 3 days and the product itself is fantastic quality. All our friends want one now! It’s so rare to come across such wonderful customer service- keep it up! Many thanks for prompt delivery and I can confirm that I am delighted with the stones and so far have cooked sirloin steak fillet steak & a rack of lamb & I only received them last Wednesday !!!! What an amazing service. Only ordered on Friday morning and delivered on Monday afternoon. All very well packaged. We are going to christen them on Thursday evening with friends. Thank you also for the gloves! Received the stones and they are a big hit. In fact, I wanted to order two of the larger Steak Plates as they’ve been so well received! Brilliant arrived very next day even though had stated 3-5 days. Cooks the best steak ever just to your individual liking. Stones arrived today very quick I must say. Once again thank you for the brilliant customer service it’s something that is rare these days and I wouldn’t hesitate in recommending you to friends and family. Just to say thanks for the quick delivery of our SteakStones. We used them on Saturday and enjoyed our meal immensely. It was nice to have a product that lived up to its expectation and quality. A very heavy package with two steakstones arrived safely earlier today, thanks very much, what great quality. We are now very much looking forward to using them once we can afford to buy some worthy steak! We used SteakStones for the first time at a hotel last week and were blown away by how incredible they were. Incredible to now have them at home! This is the best way I’ve ever eaten a steak, I can’t believe we’ve never bought these before! What a fantastic product, we had a great steak last night – every bite cooked to perfection! Just wanted to say we had steaks for tea last night. The meal was mouth watering and delicious. I truly believe it was nicer than any steak i have ever had in a restaurant. The steak were so juicy and succulent and just melted in your mouth. Thanks for the excellent service. SteakStones Lava Stone Dining Products are redesigning the enjoyment of Hot Stone Cooking the World over. Used by leading Restaurants looking to offer something fun and entertaining for their guests and food fans at home who want to put on a great dinner party for family and friends, our products are designed in-house by our culinary experts and are manufactured from some of nature’s strongest and most sustainable products, including Lava and Bamboo. The super-heated Lava Stone is perfect for cooking all manner of Steaks live at the table, from Fillet, Rib-Eye and Sirloin to Salmon, Tuna and Swordfish and equally awesome for searing Lamb, Lobster & Scallops. If you’re searching for SteakStones, Black Rock Grill, Lava Rock Cooking, Hot Rocks, Stone Grills or any of the many other names this fantastic concept is known by, you won’t find a better selection or quality anywhere, that's the SteakStones Guarantee. www.steakstones.com.au is designed specifically for our fans in Australia & New Zealand with all prices shown and taken in AUD. If you're visiting from elsewhere, please click on the relevant flag at the top of the page. Please see T&C's for further details. Thanks for visiting and happy sizzling!